For the tourist looking for spectacular natural landscape and unending amount of outdoor activity and adventure—Chamonix, France on the border of Switzerland provides one of the most beautiful locations. There are plenty of different styles of Chamonix Holidays to choose from with hotels or camping locations depending on your personal comfort level. Chamonix holidays will automatically relax overworked individual and you can release all your worries and concerns by submerging yourself in the grand plaza of nature. The “roof of Europe”, the world’s third-ranking most visited natural area, continues to attract millions of visitors and thousands of mountaineers every year. Conquering Mont Blanc is a dream shared by many amateur mountaineers and enthusiasts. This dream is possible as long as one does not underestimate the apparently easy slopes of this legendary mountain. Mont Blanc meaning “White Mountain”, is the highest mountain in the Alps, Western Europe and the European Union. It rises 4,810.45 m (15,782 ft) above sea level and is ranked 11th in the world in topographic prominence. The two most famous towns near Mont Blanc are Courmayeur in Aosta Valley, Italy, and Chamonix in Haute-Savoie, France—the site of the first Winter Olympics. A cable car ascends and crosses the mountain from Courmayeur to Chamonix. There is a huge choice of outdoor activities that includes rafting, paragliding, mountain biking, climbing, and summer tobogganing. You can also enjoy an adventure park, a sports centre, and a regular 18 hole golf course or mini-golf. One of Europe’s highest cable cars to the spectacular Aiguille du Midi on Mont Blanc is available for the whole family. The famous rack railway to 6,200ft to admire the stunning Mer de Glace glacier, or take a trip to Les Houches, Chamonix’s quieter village neighbor, 6km down the valley. 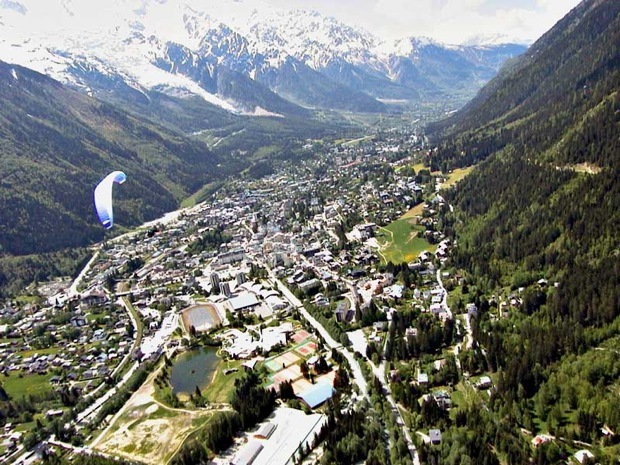 Chamonix provides a variety of accommodation, many different tasty restaurants, and Chamonix’s pedestrian streets have a large choice of shops, with fabulous shop windows and some of the most prestigious brands.